In July 2017, Northern Club Latuoka took an historic decision to install a grid connect solar system to promote the use of Renewable Energy and create awareness in Fiji & the Pacific. With the huge membership that the Club enjoys, this project found instant and total support as most members are highly knowledgeable and understand the high importance of Green initiatives in the region. MV Solar Scores Another Win! We have another reason to celebrate! UPPER Hunter solar power specialists MV Solar have had a turbulent year, but recent recognition has proven they still put the customer first. On Friday, April 9, the family business was awarded the Trades and Industries, small, award at the Muswellbrook Chamber of Commerce and Industry Awards night at the Muswellbrook RSL Club. Due to a downturn in the mining sector, our local economy has been suffering in recent times. 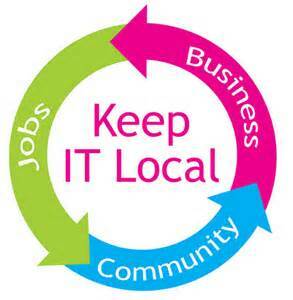 As a local business we are committed to our community and fellow business owners, and hereby pledge our commitment to promoting, preferencing and supporting each other through our Keep it Local partnerships. The businesses listed on this page have signed our pledge form, agreeing to do the same. A myriad of options are available for commercial installations which are usually only limited by contraints of the site. After a comprehensive site audit and analysis of relevant client provided data (electricity bills, usage patterns etc.) we can determine the parameters of the design. Limitations can include available roof space and orientation, maximum electricity consumption, solar availability and the size of available of cabling and whether an upgrade in the existing electrical infrastructure is required. With these parameters in mind a discussion with the client takes place to determine the required system design. On Friday, September 11, our Chief Technology Officer Gary Ellem and Business Development Manager Karen Portolan represented us at the 2015 Hunter Region Business Excellence Awards. MV Solar has been a regular finalist at these awards and again were successfully short listed as finalists. Business owners, Michael and Lois Valantine were taking a well deserved break and were delighted when advised that MV Solar had won the award for Environmental Excellence, the second time MV Solar have achieved this distinction in recent years. Over time you will notice the benefits of having solar on your home. It may be in the form of the money you get back from your excess power generated, or the savings you notice on each quarterly power bill. Seeing these benefits has prompted people to ask the question- what can I do to improve on my system? The most common thing that people will look at doing to their system is adding more solar panels. A number of installations when solar first came onto the market are smaller systems- two to three kilowatts. When you look at the average system size now, we are talking about five kilowatts on a regular size family home. The blackouts for Hunter residents as part of the storms earlier this year could soon be a thing of the past with the emergence of new home energy storage technology. Selling Or Renting Your House? Time To Buy Solar! New surveys by the prestigious Berkeley Labs in the US and realestate.com and Origin Energy in Australia have highlighted that prior to selling or renting your house is one of the best times to go solar. Installing solar is typically something we often think about when building or buying a home. Banks are happy to support the idea by including the cost of a solar system with your home loan. This is a great option for becoming more self-sufficient and reducing energy cost over the longer term. While people recognise that investing in solar is a great option when buying or building, we find that home owners and investors often hold off on installing solar when they are thinking of selling or renting their homes. This new research highlights that rather than holding off when renting or selling, this is in fact the financially most lucrative time to install solar. Paybacks are much faster and more lucrative through improved sale and rental prices. Following some new analysis MV Solar has now switched to using the combination of a rooftop mounted Solar PV panels and an electric heat pump as our default solar hot water solution. This brings MV Solar customers the lowest cost and most adaptable solar hot water system available which can even reduce summer air conditioning costs! Hot water and air conditioning are two of the largest energy costs in your home. Most people know about solar hot water systems that use a flat plate or evacuated tube collector to heat your water. These systems have now been superseded by a new way of making hot water from the sun that saves on both your hot water and air conditioning bill. MV Solar... Here To Help! Over the past week, MV Solar has been receiving a few calls from concerned Denman residents. What has our neighbours so worried? Door to door sales people... That’s what! Is West The New North? While our office may be off the beaten track, at MV Solar we are still in the loop with current news and trends in the industry. So when we started hearing that panels should be facing west, you can imagine we were a bit surprised, and curious. But, all it takes is a few words with our solar specialist, Michael Valantine, to learn there is a lot more to it. On Friday 6th September Michael and Lois Valantine attended the 2013 Hunter Region Business Excellence Awards. MV Solar has been a regular finalist at these awards and again were successfully short listed as finalists. Michael and Lois were delighted when MV Solar was awarded the Environmental Excellence Award. "Recognition in this category was a wonderful surprise" said Michael. "This particular award is assessed across all finalists, in all categories and to be the recipient this year was both humbling and exciting for our company. We are passionate about Solar and the positive environmental outcomes solar has for our planet – to feel that our work in that area and also the way in which we do business is recognised as achieving the goals we set ourselves is satisfying and motivating. Is PV Solar Power Cost Effective? Can I Save Money? What Does It Mean By Free Electricity? Driven by various ad hoc State and Federal government schemes, PV solar power has come from nowhere a couple of years ago to become a major supplier of electrical energy to over 120,000 Australian households, although the general public still don’t fully understand how solar and in particular, grid connect solar works. It can be very confusing and hard to work out whether grid connect solar power is really worth it.